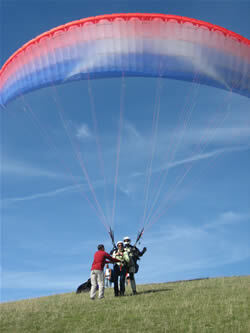 Tandem flying is the ideal way to get a taste of paragliding. 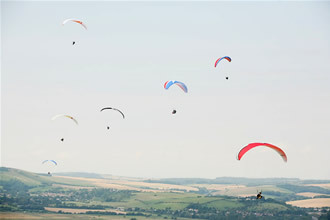 Given good weather, a highly experienced pilot in control of a large, stable paraglider can take his passenger to the base of the clouds in comfort. Often we fly up to 4000 feet in Sussex, far above the heights normally flown by other light aircraft, using only natural lift from the wind and thermals. In the right conditions, the passenger can assume control of the glider; or just relax, admire the view and take a few photos. You don’t need to be especially fit to fly. Take off and landing involves running just a few steps and once airborne you sit back in a comfortable seat and perhaps lean a little to assist turning. Call us to discuss any particular concerns. We are able to take passengers weighing between 35 and 100 kg (5.5 and 16 stone). Those under 18 years old require written parental consent. We can fly throughout the year, in summer we can go thermalling with the aim of getting very high. In winter we get glorious smooth air and often the opportunity to fly some of the South's spectacular coastal sites. In the winter we are often teaching abroard so available dates may be limited. The pilots are always abreast of the weather situation and can discuss exactly when is the best time to fly with us. The decision to go ahead with the day is made at about 8:00 p.m. on the preceding evening. A message will be left if we’re unable to answer the phone. All aviation is weather dependent, and if you are unable to fly we simply re-schedule. The gliders fly at about 20 mph, so that wind-chill combined with some extra altitude can make it a little cold. We have some gloves, flying suits and helmets for loan; You'll need some ankle supporting boots, warm clothes and some drink and snacks to make your day on the hills a comfortable one. All our sites are in Sussex, easily accessible by road or by public transport followed by a short taxi ride. A typical day's flying begins the day before by phoning in at about 8 pm to check the weather is suitable and arrange a meeting time and place (see the map adjacent for locations). 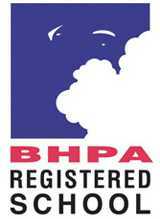 We'll meet our small group in the morning and spend half an hour with preliminary safety briefings and signing in, either on the flying site or at a convenient meeting point. On the take off site, we'll check the conditions, inspect the glider and begin flying as soon as the conditions permit. The glider performance varies with weight, so we fly in the best conditions for each member of our small group as the weather of the day develops. To get the best out of the day, we are ready to fly from first arrival on the hill until dusk. We hope you will choose to taste this most elegant of forms of aviation with us.